This French manufacturer built its first motorcar in 1891. In the early days of the automobile, the company led the way in French car design and motor racing. By the 1930s, Panhard had become known for its medium sized and touring cars. Following 1945, Panhard concentrated on building cheaper models typically owned by family motorists. Many of its designs used simple two-cylinder engines. In the early 1950s, small industry sports car manufacturers in France were building sports cars using the Dyna-Panhard engine and chassis. 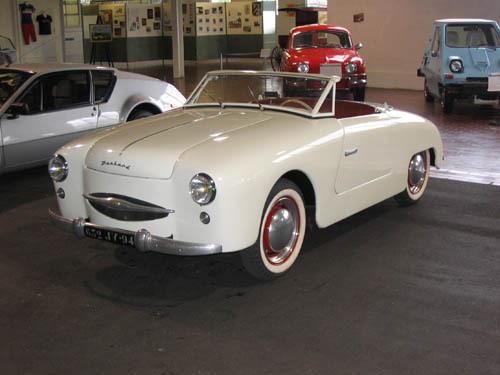 In 1952, Panhard began producing the Panhard Dyna Junior Roadster. A face-lifted model was introduced in 1954 - the Cabriolet model you see here. By the mid 1960s Panhard was in difficulty, which led to Citroën purchasing the company in 1965. Production of Panhard cars finished in 1967.